Tai Chi is an ancient Chinese art of body and mind harmony and can be described as a combination of yoga and callisthenics. The results of its practice include the health benefits of both allied with the restorative effects of meditation. It is often described as moving meditation. There are however many misconceptions about Tai Chi, the main one being that it is not a martial art, that it is merely Chinese shadow boxing and cannot actually be used for self-defence. This has arisen from the fact that many people who teach Tai Chi both in the east and west have a limited knowledge of the art. Tai Chi when taught correctly, as by Wu style Tai Chi can be a formidable self-defence system for those interested in this facet of the art. It is up to the individual to put the emphasis where he or she wants. You can pursue the purely meditational/health aspects of the art or also the more rigorous path towards boxing prowess – however Tai Chi taught by someone without knowledge of the martial aspect can easily degenerate into a meaningless set of movements. The Bendigo Tai Chi Club Inc was founded by Alan Smidt in 1983 at the behest of Master Rocky Kwong. 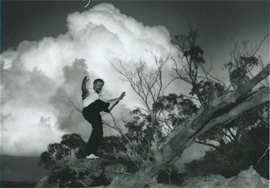 The Bendigo Club is affiliated to The Australian Federation of Wu style Tai Chi, the oldest Tai Chi school in Australia. The club teaches the five pillars of the art - the solo exercise, push hands, boxing self-defence, internal exercises and the three traditional weapons. Classes are held on Thursday nights at the Bendigo Trades Hall with classes for Beginner, Intermediate and Senior students. New beginners classes start in February and July.